Finding a cure now... so our daughters won’t have to. Posted By PA Breast Cancer Coalition on June 15th, 2015 at 8:35 am | 0 comments. Superheroes. That’s how Perry County survivor Ann Marie Potter described her two sons who stood by her side while she battled breast cancer. Ann Marie joined survivor and Grassroots Partner Helen Michener in sharing their personal stories, struggles and messages of hope at the opening of “67 Women, 67 Counties: Facing Breast Cancer in Pennsylvania” at the New Bloomfield Public Library this month. The photo exhibit was was on display June 4-13. Speakers encouraged women to get their annual screenings while sharing stories from their own personal journeys with breast cancer. The PBCC welcomed dozens of community members for a week full of education and empowerment. We would like to thank the entire exhibit committee for allowing us to bring the display to New Bloomfield. The PBCC would also like to send a big thank you to Karns Foods for generously donating a delicious spread of food for the exhibit’s June 4 reception! The PBCC’s exhibit features women from each of Pennsylvania’s 67 counties, along with messages about the ways in which breast cancer has touched their lives. The women reflect the diversity of Pennsylvania, and their stories reflect the impact of breast cancer on themselves, their families and their communities. The exhibit encourages women to learn about early detection and celebrates survivorship. 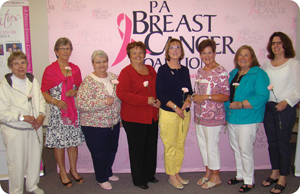 “67 Women, 67 Counties: Facing Breast Cancer in Pennsylvania” is sponsored by the PBCC and funded by the Pennsylvania Department of Health. Would YOU like to be featured in the PA Breast Cancer Coalition’s brand new photo exhibit? Click here to share you story with us! The PA Breast Cancer Coalition is eligible to receive corporate support through the Educational Improvement Tax Credit/Educational Improvement Organizations (EITC/EIO) program.